Macroscopical Features: Habit, Surface Characteristics, and ConsistencyAnatomy and Aquiferous SystemCytologyReproductionArchitecture of the Skeleton and Spicules of Hexactinellida Calcareous Spicules and Calcareous Spicule SkeletonArchitecture of the Skeleton of DemospongiaeCalcareous Rigid SkeletonSpicules of DemospongiaeSpicule Types of "Lithistids"
This project is supported by the National Science Foundation Assembling the Tree of Life program under Grant No. 0829986 and REU supplement. Any opinions, findings, and conclusions or recommendations expressed on this website are those of the authors and do not necessarily reflect the views of the National Science Foundation. Boury-Esnault, Nicole, and Klaus Rutzler, editors. 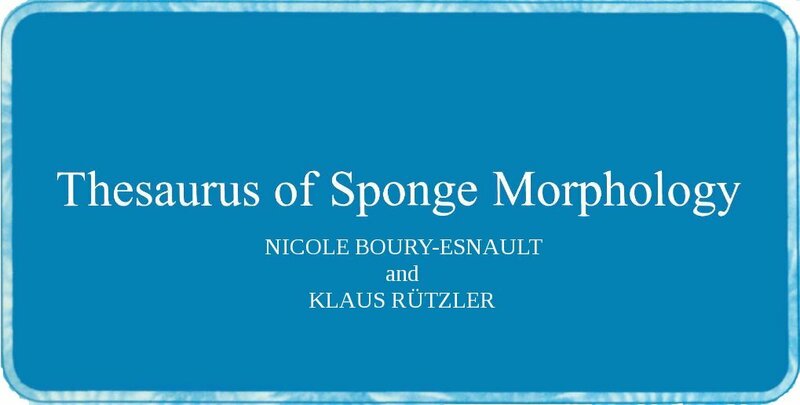 Thesaurus of Sponge Morphology. Smithsonian Contributions to Zoology, number 596, 55 pages, 305 figures, 1997.